Hey, everybody! On this video, I want to show you 5 ways to make your Facebook ads better so that you can convert more visitors into customers. Facebook Ad not delivering? 1 – Use stopping power images with high contrast: By doing this you’ll have a pattern interrupt. It has to have stopping power. Use Canva or Photoshop, it will actually help you increasing your click through rate (CTR). 2 – Call out your marketplace: Identify a need and offer potential customers a solution for that problem that will actually help them and address your marketplace in your ad copy. 3 – Storytelling: Stories work really well and if you pair that with emotion in your copy, it will work as well to increase the click through rate of your advertising. 4 – Be simple: You want to convey the message as simply and powerfully as possible. Don't over complicate your ads. 5 – Offer Social proof or credibility: Use data, studies, facts and testimonials. I suggest you to put in practice these 5 steps to get better results with your Facebook ads and get more conversions. 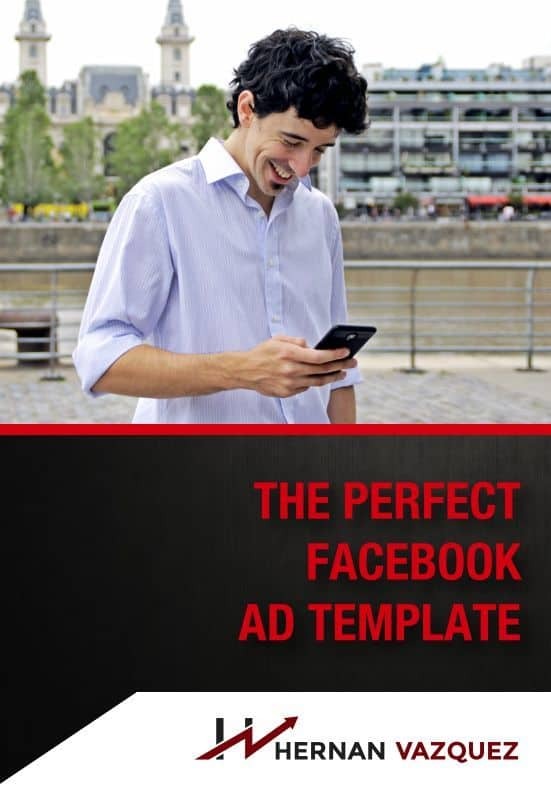 Check out this awesome Facebook Ad template. Hey, what's up my man? Let's talk about why your Facebook ads doesn't work and five ways to solve it so you stop sucking. Hey guys, what's up? Hernan Vazquez here and on this video, I wanted to tell you a little bit about how to improve your Facebook ads or in other words, how you have five wastes to make your Facebook ads less and less sucky. Here I'm going to tell you how to actually make your Facebook advertising work better with these five simple steps. Let's just make it happen. With that said, you can also come and join the free Facebook group. How many times I'm going to need to mention for you to come and join the free Facebook group? There's nothing Machiavelli going on here. It's just a free Facebook group. It's completely innocent. I swear to God. It's on Facebook, it's PG 13-ish, so you can come and join. There's a lot of good people in it. There's not going to be any asking for money, maybe just a little bit, but not a lot of asking for money and you will get a lot of free value as well. If you're really, really, really like you really want to grow your business, like you have this feeling here in the belly that goes up and goes down and you burp, wanting to grow your business, that's probably a condition so you want to see a doctor. In any case, if you really want to grow your business, you should hit that subscribe button because magic things will happen if you hit it. Just hit it once, not more than once because it's going to unsubscribe you. You don't want to try that. Let's jump into the five steps on how to actually make your Facebook advertising better. Again, one of the main pet peeves of many of the votes and in the Facebook group is how to actually make the Facebook advertising work, and there's basically five steps that you can use right now today to actually make your Facebook ads better. Starting with the image. The image is the number one asset that you can have on your Facebook ads and what do you want to do is on the image is to have a pattern interrupt. There's going to be an example over here somewhere by the power of editing and you will see on this example that I'm using an image that has nothing to do with the product that I'm promoting. 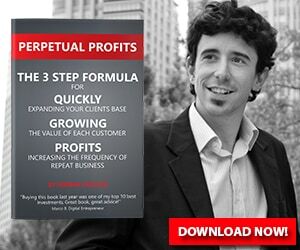 On this ad, I'm promoting my book Perpetual Profits, but there's not a picture of the book and there's not a picture of profit, just picture of me. What you want to do with the image is to interrupt the pattern. It has to have stopping power and the same with videos, right? You don't want to go ahead and say, “Hey guys, this is the book, go get it. It's amazing.” No, that's going to bore you to death and you're actually going to die by watching this video so don't watch it, but what I'm saying is you want to have images or videos with stopping power. You want to have some pattern to interrupt and unexpectedness is also how it is known in the higher circles of Harvard course, but you want to have that stopping power. Here's a pro tip. Jack app the contrast of your images, like it really stands out in contrast with the white background on Facebook. Jack app the contrast on the images. You can do this with Canva or Photoshop, whatever, and it will actually help you increasing your click through rate. Now that you have an image that has some sort of pattern to interrupt or some sort of stopping power, the next step is to actually call out your marketplace. On the first line, the first line of copy that you write needs to be calling out your marketplace. For example, for my book, again it's going to be an example here. For my book, I'm saying something like, “Hey, do you want to get more clients but you feel the marketplace is overcrowded?” You see what I did there? I'm calling out my marketplace because people that want to get more clients online, but they feel some way, shape or form of they're feeling overwhelmed or they're feeling frustrated because they cannot reach their target marketplace. They feel that there's too much competition out there, so I'm calling them out. That's step number two. Call them out, pair that way to stopping power image and you could potentially have a really deadly combo. People will click on it and then they will blow up in a lot of millions of dollars going your way. Number three is storytelling and if you ever watched any kind of fun advertising on TV or if you go back and watch the Super Bowl ads from last year, there's a lot of storytelling going on. By storytelling, I also mean hopping in emotions. If I were to tell you how bad I was initially at getting new clients, how psyche I was at saying no, how piece of crap clients I used to get, I will be actually telling you a story and stories work really, really well and if you pair that with emotion in your copy, it works really, really well as well to increase the click through rate of your advertising. Now with that said, the image, the bigger the emotion on the image, the bigger the stopping power it has. By that, I mean you want to have aspirational and native images. Native meaning that they don't look like an app, right? They look like just me hanging out on the beach on this case, but aspiration in meaning that they have a lot of emotion to it. If you see this, it's just a guy hanging out in the beach, chilling, and then you could say that I'm reaping the rewards of having an internet business which is push button making millions of dollars. That's not true, but this is kind of the picture that's working the best for my book. Again, storytelling and emotions, there needs to be a place, call out your marketplace. I'm doing it the other way around, but again emotions and storytelling, call out your marketplace and have a really good image that's aspirational and has stopping power as well. The next thing, step number four, is to actually get some simplicity going. You don't want to over complicate your ads. I have these specific cheat sheet that you can download. It's going to make your life so much easier and it's basically focused with steps. Check the boxes and you will have an unstoppable Facebook ad. Simplicity is also really important. You want to convey the message as simply as powerfully as possible and these cheat sheet right here is going to help you achieve just that, and it's completely free to download. There's going to be a link somewhere that you could download really, really quickly. Number five, some things that you can use that really increased the conversion rate of your ad and the click through rate of your ad is social proof or credibility. Social proof are basically saying testimonials or actual data that you can add. Did you know that 58% of people went to sleep without washing their teeth last year according to the Institute of Teeth Washery on the US. That's a hard and fast data and don't go on me that because that's just BS, but that's a hard and fast data that you can use. Or B, you can just say Hernan changed my life, okay. Something like that that's a real testimonials that you can use and that will increase the click through rate of your ad several times. Again, let's just recap. Number one, stopping power images with high contrast. Number two, calling out your marketplace. That works really, really well in the first line. Number three, storytelling. That storytelling again can be on your copy, on your image, and on your video. Number four, simplicity. You want to convey the message is simply and powerfully as possible. Number five, social proof. That comes in the shape of data or testimonials. Again, there's going to be a link somewhere around here so that you can download my perfect Facebook ad cheat sheet is going to walk you, literally walk you through the step by step system that I used to put out amazing Facebook ads no matter what I'm selling, if I'm selling kitten socks or if I'm selling a book about how to make more money online, it works just as fine, okay so this is the spreadsheet, that cheat sheet right here, and you can download it by clicking on the link somewhere around here. I also want to invite you to join the free Facebook group. It's completely free and you're going to love the content and the people that's within that Facebook group. Make sure though then when you click on the link to join the Facebook group, you answer the questions because otherwise, you will be kicked out and cast away from your home. People will come and evict you and you don't want to do that, right? Anyways, guys, thank you for watching this video. Once again if you have any questions, just drop them on the comments and I'll see you.Bye.